A Brit living in France, Ewan heads up a group called Sons of the Desert (they're also on MySpace, natch). He also performs as a solo artist and in a duo with his wife, Tracy. 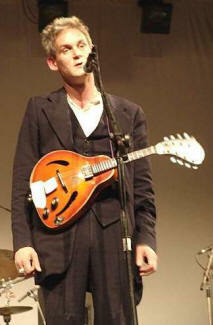 Not sure what's up with his mandolin, which resembles a Hofner that was left in the sun too long.